…Wimbledon is starting tomorrow not today. fell from the skies above: RAIN! No Wimbledon and also no Test Match between England and Pakistan. Gags about wet weather at Wimbledon. Now there’s something that’ll never catch on. as it used to be called. At least I think I don’t know. It might have been between Spurs and Liverpool, and Spurs won. The Lord of the Rings on Radio 4.
and precisely 30 minutes of Dr No. Yes, even while Dad was there in the room. My confusion about who had won the Littlewoods Cup final is perhaps explained by the fact it had yet to take place. The match was actually on 5 April. As such I haven’t the faintest idea what I’m talking about here. Both Spurs and Liverpool were in the semi-finals, but in different matches, held nowhere near today’s date of 22 March. Indeed I see that Spurs had to play their match against Arsenal three times before a winner emerged. And it wasn’t Spurs. Anyway, that clearly wasn’t the most important event of the day. The first 30 minutes of Dr No represent perhaps the most boring half hour in the Bond canon, but at least I got to watch them, as they were broadcast, in my own home. Something of a result, then. 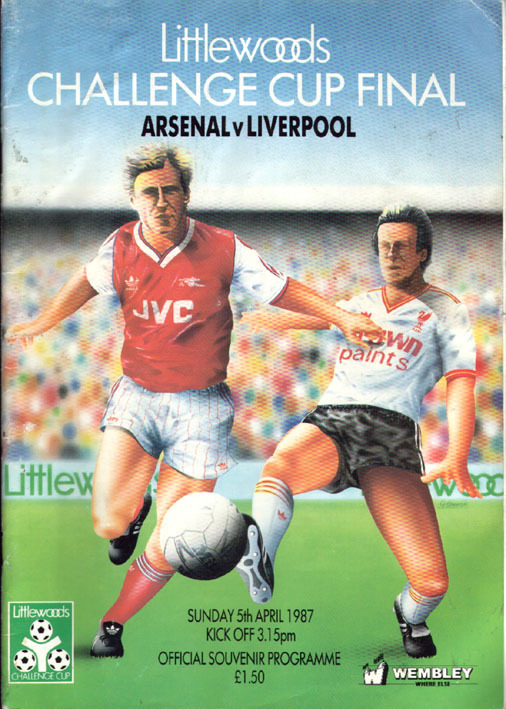 Which is more than can be said for Liverpool, who went on to lose the 1987 Littlewoods Cup final to Arsenal. give a talk on cricket and to show people how to play properly. They asked questions and if you got one right they gave you a prize. 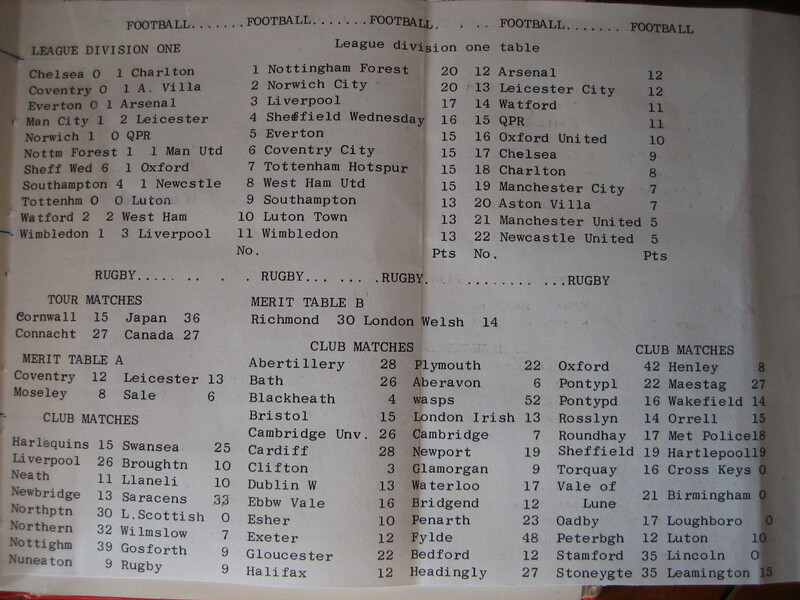 I managed to answer one right and got a 1983 Guide to the Prudential Cup. One girl got a book priced £1.95 for answering her question right! team, and how to join the team, and signed autographs. After break we had a quiz on what we had learned. I’ve had to look up who these two people were. Both were professional cricketers for Leicestershire, although I think only Potter was still playing for the team in 1987. What were they doing coming to our school? I haven’t a clue. Perhaps the local education authority had launched another new initiative. But evidently it had yet to be finessed; witness the handing out of scoresheets from a match of two years previously, and worse, the awarding of a “prize” that covered a competition almost half a decade ago. Obviously they thought we’d lap up any old tat, being no old enough to know better. The Prudential Cup was actually the World Cup. Now why didn’t they say so? Not that I would have shown it any more respect, still having to reach the age of starting to hoard stuff simply because it was old. A book “priced £1.95”! It was as if a yuppie had moved into our town. …Top of the First Division is Notts Forest with Man Utd at the bottom. It’s pasted into my diary. I can only guess it was another passing eruption of my fickle fondness for recording details of events I otherwise had no concern with whatsoever. Still, Manchester United – five points!